Darcy’s secret longing for a woman who will not have him. Elizabeth’s determination to marry for love, and not money. An epic battle of wills…who will win and who will wed? Five years ago, Darcy prevented Lizzy from eloping with their mutual childhood friend Wickham. Heartbroken and infuriated, Elizabeth never forgave the interference, especially because it caused the banishment of her family from Derbyshire to Longbourn. Now Wickham is back, as devilish and handsome as ever, ready to coax Lizzy into yet another mad scheme. This time when Darcy intervenes, it will not be just to save Lizzy from herself…but to claim as mistress of Pemberley the woman he has always considered his . Only, Elizabeth is determined not to wed for fortune or reputation, but for true love. 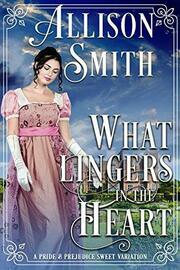 And cold, stern Darcy does not love her—he wishes to save Wickham from making a poor match. 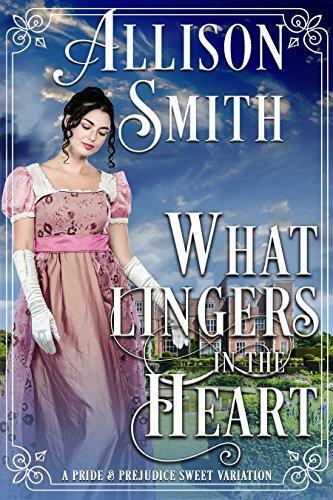 What Lingers In the Heart is a Pride and Prejudice Sweet Variation reimagining ODC as childhood friends to enemies and finally to wedded lovers. For readers who enjoy clean and wholesome romance, compromising situations, forced marriage, and plenty of sparks between a protective, commanding Darcy and a tart, defiant Elizabeth.